The Granite Wash gridded formation-thickness map results from adding the Pennsylvanian System and the Wolfcampian Series isolith maps of Dutton (1982a) (c3granitewash). Then the areas where the percent carbonate is greater than 40 percent and the Granite Wash percent is less than 30 percent, the maps of Budnik and Smith (1982) are subtracted from the areas defined as Granite Wash. The two cutoffs, 40 percent carbonate and 30 percent granite wash, are chosen because they are the lowest percentages for each of the lithologies, respectively. 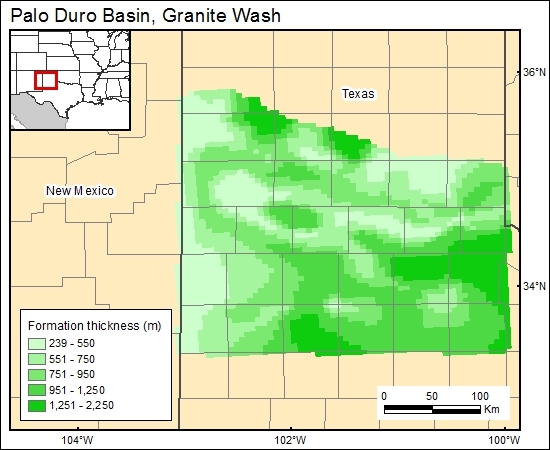 The main assumption here is that the shale percentage (for which there is no map) is included as part of the total Granite Wash isopach.